From my understanding, ESG is a band that gets to you before you get to them. Early in high school, when buzz finally got from New York to my Miami abode via my mom’s NYMag subscription of those found noise pranksters with a mean hankering for a groove, Liars, beats had only begun to mean something. Those 9 tracks on their first album might seem tame now, but my lack of a concern for dancing (aside from my first inebriation in 7th grade at a family function thanks to drinks left unattended) was becoming something to be concerned about in itself. Liars’ stilted high-BPM groove didn’t really help that much but their song Tumbling Walls Buried Me in the Debris w/ ESG was one of many doors. The use of UFO was by then old hat, historically plundered more than almost any other song, but it was my initiation. Being the time of cult experimentalism and whatnot, it’s that song’s ethereal and otherworldly rumblings that lit up my room at night, playing close-lidded REM games in the dark. UFO itself came from the age of a dimly lit, smoke-clouded, alleyway-shrouded, and ever enveloping concrete undergrowth, when the streets of New York could easily make their way into a subplot for a supernatural thriller as a psyche-disorienting character of their own. At any nightclub, under the pulse of the strobe light, amid the goading, jagged aesthetic reconfigurations of punkish prowlers any pseudo-scientific lore might seem to be manifesting itself. UFO is almost its curator. UFO’s curators are something else entirely. Scene – 70’s in the South Bronx: Four sisters left to their own devices by a caring mother attempting to cultivate a trouble-free developmental environment, must learn to play instruments without the aid of lessons. Meager income, economic hardship could only bring home the tools, the craft was a venture to be gained the hard way. Crash course after self-devised crash course through rock and soul music television programs and the girls began to hone their sound. 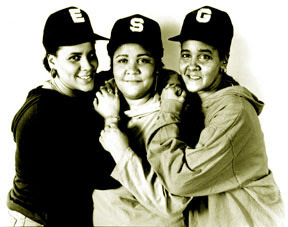 Deborah on the bass, Marie on the congas, Renee on the guitar and Valerie on the drums, they eventually became ESG, a name corresponding the minerals of their birthstones – Emerald for Valerie’s, Sapphire for Renee’s, and since Deborah and Marie had no birthstones hip to the ensuing acronym, a G went to wishful thinking for a record prospect called GOLD. Signed by Liquid Liquid’s label manager, the rest is history. The same way UFO’s eerie manipulations of aural scratch come to be the first and last thing you notice, the same can be said for Valerie’s drumming. By the end of high school I still didn’t know how to dance (though I’ve since found it’s not really something you learn, but make up as you go along, with the best coordinated in the room deciding whether its up to snuff) but I did have an interest in shaking it. One of the surest ways was turning the switch on ESG, whose ship ran so tight that with the amount of time not wasted you didn’t even notice it leaving the harbor, two seconds in the cruise is already in high gear. Whether that cruise has run into the Bermuda Triangle is something you’re never entirely sure of. A perfect embodiment of that feeling is this youtube sync done with some television drama’s dream sequence and ESG’S Christelle. The arrangements are sparse, but forceful. Their simplicity is disingenuously innocuous lull that could place you in a lucid transfixion if it wasn’t for the rhythmic pattering underneath which commands you to MOVE! UFO itself distills the distals of your body til the essence of your groove is ripe for discovery. Valerie shows up unannounced 25 seconds in. Deborah’s bass is in the midst of an introduction when Valerie sideswipes in the most complementary fashion, and soon you’re being dragged through this odd aura of swinging overhead lights, rusty from their years confined to dark tunnels for the hideouts of military secrets. But all throughout, that groove says its cool. When it wasn’t the atmospherics doing the tricks, it was the vocals, of which everyone took a part except Valerie, ready and steady on the beat. While the previously mentioned songs play with an instinctual urge, this song shouts it out from hiding. Dance is basically it’s title expanded into an experiential manifesto, a how-to by way of being done. This is what I want to do, this is how I get it going and this is how it’s done. It is now an unstoppable force whose longevity can only be pointed out by the sun’s inconvenient arrival the next morning. Valerie ended up the cause of controversy when in 2006 she was indicted for a false insurace claim garnering 13,000 in worker’s comp for a shoulder injury that prevented her from driving while two months later playing reunion shows. Valerie maintained that the candid cam video used on her in the trial shows that her arm was limp and her lawyer maintained that three doctors says she wasn’t fit to drive a bus. It’s kind of silly, since playing the drums doesn’t really put the audience in danger the way driving a bus does passengers, which while not the main point is better than driving a bus when the diagnosis suggests the conditions aren’t affable. Nothing on that mix-up lasted longer than the print date of its conclusion, unlike Valerie’s musical contributions. ESG’s name remains in multiple spectrums of dance music. Larry Levan and Frankie Knuckles dropping a needle on their records ensured their influence in the ever-developing variations on house and club music. Their manager booking shows for them at punk clubs ensured the nasal assault of faux-nihilistic teenagers would be alleviated by a productively danceable backbone, so when the alternation between screeds and apathy was ultimately shown aimless, the hips could take over, and the stale march would be conga fixed. Previous ArticleTom Tom Magazine and Make Music NY Presents @ Public Assembly!Next ArticleFinally! Interview with Sarah Datblygu of WETDOG! !